Alexaner Hume Ford : Famous Seaside Resorts Around the Globe, 1909. 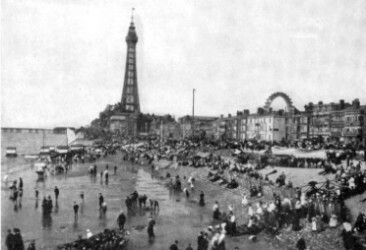 Alexander Hume Ford : Famous Seaside Resorts Around the Globe. Travel : The magazine that roams the globe. Volume.14 Number 11, August, 1909. In the list of contents, the author is noted as Arthur Hume Ford. ON THE STRAND AT OSTEND, BELGIUM. WHEN the tourist ﬂying machine is an accomplished fact, it will be interesting to ﬂit around the world and glance down upon the famous seaside watering places that encircle our globe. The man from above will observe that the sun never sets upon American bathers disporting themselves in the surf. The American has established seaside resorts entirely around the globe and only Britain attempts to rival him, but during the summer months even the seaside resorts of Europe are crowded with Americans. 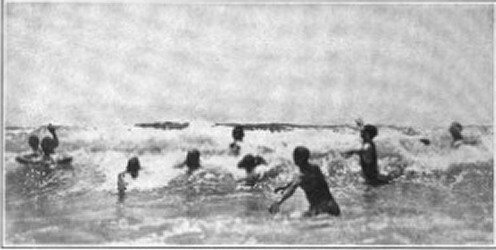 When it is sunset in Porto Rico, where the American has created new diversions in the sea, it is sunrise in the Philippines, where the American soldier is taking his ﬁrst dip of the day; in between are Newport, the most ultra-fashionable seaside resort in the world, the summer and winter resorts of the California coast, Waikiki in Hawaii, and Pango Pango in Samoa. The American, in fact, is never out of warm sea water. summer or winter. In Europe there are several world-famous watering places washed by the sea. France has Nice on the Mediterranean, as Italy has Capri, while in the Atlantic the King of Spain and his aristocratic suite disport themselves at San Sebastian, while the French aristocracy dips itself into the waves at Trouville. Belgium boasts her Ostend, the most luxurious seaside resort in all the world, with the possible exception of our own - millionaire- Newport. Holland in the far north has an ocean front that is one continuous seaside playground for the great middle class of Europe, as Trouville and Ostend are resorts of the aristocracy and the noveau riche respectively. But the world round each seaside resort has its own distinctive features that mark it apart from all others. 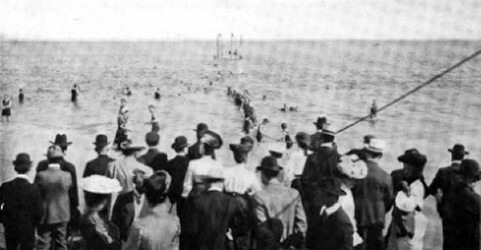 It is not every sea-girt land that may boast of inviting ocean rollers beckoning eager bathers to disport themselves. The waves that beat upon Britain’s island are inhospitable, even in midsummer, rather to be looked upon than invaded, for more than a very few months at most. SCHEVENINGEN, NEAR THE HAGUE, HOLLAND. BRIGHTON, THE ATLANTIC CITY OF THE ENGLISH POPULACE. the mountains in summer; in Canada there are no great sea-bathing resorts, in South Africa the festive shark follows his quarry to the very beach, and even in Australia no bather dare go beyond his depth for fear of the tiger of the deep that awaits him wherever there is three feet of ocean water. fear, and for one-third of this stretch at least, in winter months as well as summer. In one of her island possessions, within the tropics, her children are as ﬁsh and sport the year round in the surf without thought of cold or danger. America is the greatest nation of bathers the world has ever known, and it is therefore interesting to compare her famous seaside resorts with those of the older countries of Europe and the rest of the world. Palace and the nobility of England in surrounding country villas lead the quiet social life of the Englishman at home, for it is the summer house. out of town that is “home" to the Britisher, and not the city mansion where the social functions of the gay season are held. Brighton, just across the channel from the Isle of Wight, is the Atlantic City of the English populace, while Blackpool, in the north, near Liverpool, is its Coney Island. There are no boardwalks it is true, for on the other side they build solid granite sea walls and concrete drives that will last as long as the old Roman roads that still exist. But, perhaps, after all, Scarborough, on the North Sea, near York, is the typical British seaside resort, where men and women in stately dignity bathe in separate waters, for the English husband of the upper middle class. may not look upon his own wife in her bathing suit. We have nothing in America like Scarborough. It is English, thoroughly and exclusively English. On the American mainland, Newport, Atlantic City, or Coney Island, as you look at it, is our most famous seaside resort. These resorts are so well known to us that no words need be wasted in describing their particular attractions and differences. Perhaps in all America, the water sports at Waikiki Beach are best known abroad, for it was the wonderful feat of the surfboard riders that sent the fame of Hawaii around the world long before we annexed the islands as a territory. that is always of the same warmth as the human body. Men, women and children often return upon the surfboard of the Hawaiians, balancing in an erect position upon the very crest of the billow. Surf riding, surf boating and body surﬁng are the great pastimes at Waikiki. At Durban in South Africa. 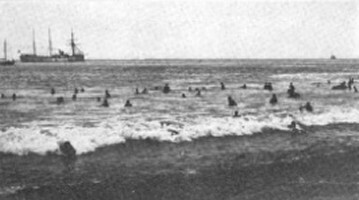 however, the body surfers boast superiority over those of Waikiki, the waves at Durban being short and powerful, hurling one forward with frightful velocity, seemingly to certain death upon the hard sea sand, but a thin cushion of water forms between the chest and the sand so that the swimmer goes shooting at headlong speed far upon the beach. SURF BATHING AT SANTA CRUZ, CALIFORNIA. At Waikiki the most expert body surfers go far out to the “Nalu Nui" (big waves) and surf never nearer than a hundred yards from shore. This gives a long ride and often the shooter can keep his head erect, clear of the water, his arms stretched rigidly back, and his legs used for steering purposes. the crest curls and drops down upon him. At any rate this form of surf shooting is not indulged in at Duban for the simple reason of sharks! They infest the South African waters and even attack boats of small size. Durban has a delightful bathing strand and a magniﬁcent surf, but one does not care to go surfing with sharks. Should I intimate that Europeans, especially Britains, know little and care less about surf bathing than almost any other people living near the seaboard, every loyal Britisher would say, “Pooh !" BLACKPOOL, the CONEY ISLAND of summer BRITAIN. 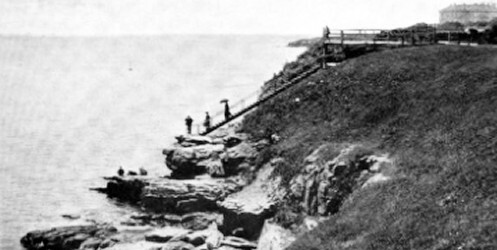 THE CLIFF WALK AT NEWPORT. But nevertheless it is an evident fact to one who travels and uses his eyes. The little ripples that come in at most of the lritish seaside resorts can scarcely be called rollers, combers, or even waves. The Britisher goes in sedately for his morning “dip” and is out again. No sporting far out where the big waves roll, for him. I often wondered why, until one day I plunged into the icy cold water that ebbs about Britain's shores, and was glad to scamper out again. Only the most hardy can remain in the water there long enough to become expert in aquatic sports. and fall twenty and even thirty feet, who will dare to sport where every back wash offers to carry a victim into some irresistible current? European waters do very well to bathe in, but not to resort to for a full day's sport. In all Europe, if not in the entire world, the most fashionable and beautiful seaside resort - where surf bathing is indulged in - is Ostend, the summer home of the King of Belgium and until recently Europe’s northern Monte Carlo. Nature provides a beautiful beach. Napoleon built a fort at Ostend, and the Belgians spent millions on palaces and a Digue, or greatstone breakwater , the top of which is paved with beautiful Dutch tiles. SURF BATHING AT APIA, SAMOA. 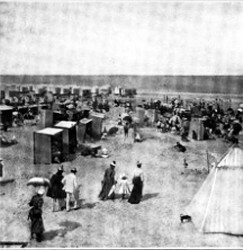 In the season thousands of the best dressed children in Europe romp on the sands, while their nurses and governesses sit in the little private tents, provided for them and just large enough for one person. see occasionally some daring couples trot down from the steps at opposite ends of the bathing house, that is drawn into the sea by horse power, meet, take hands and run a little way toward the ripples that lap their knees, shiver a bit and run back to their toy house. On the strand there are thousands of these little houses on wheels, great streets of them. 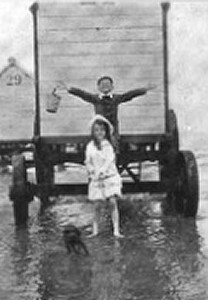 but the greatest use I have seen them put to is by the little Belgian children who come down from the town in droves with their dolls, to play “house” with the bathing machines. There are other fashionable seaside resorts in Northern Europe. 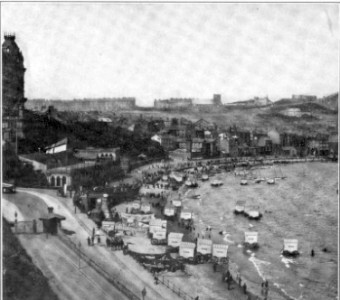 At Trouville near Havre, the aristocracy of France run down to the tiny ripples wrapped in sheets above their pajamas, shed the sheet for a brief instant, take a little dip, and waddle back over the sand to the little bathing houses in the town. All along the Dutch coast, too, there are bathing beaches, where people wade in the almost placid water, glorious beaches and Dresden-china-like villas, but as for the boisterous fun and sport that accompanies the real surf bath, Europe is ignorant. 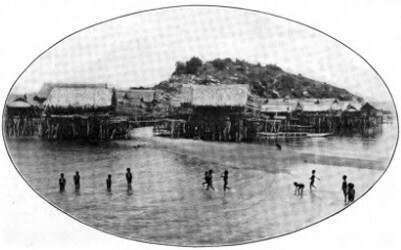 A NATIVE SEASIDE RESORT IN NEW GUINEA. They manage things differently in “Little America” south of the line. I took one of the ﬁrst ferry boats after my arrival in Sydney to the most famous of all Australian beaches - Manly, world-famous Manly. To the eye Manly is a dream of beauty. Great rollers come careering from far out at sea, foaming and boiling over a great shallow strand, and break gently upon the beach. An ideal spot for any kind or form of surf bathing- but alas! The British idea of “restrictions” has taken hold of the Australians. I am speaking seriously and narrating only absolute fact when I state that scarce had I seated myself on the beach after a dip in the waves, when a policeman came up, touched me on the shoulder and informed me that if I did not at once resume a standing position he would put me under arrest, and that the ﬁne for sitting in the sunlight on an Australian beach is twenty—ﬁve dollars (ﬁve pounds). I arose, and observed that great, strong athletic men made all haste to run from the bathsheds to the sea and back again without loitering for a moment on the glorious sunlit sands. 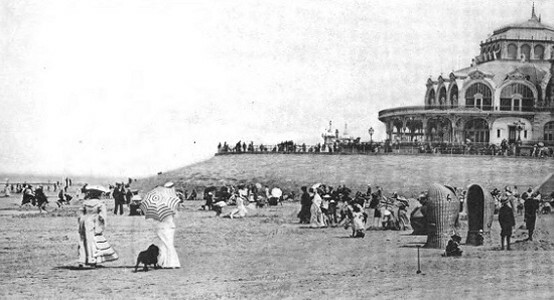 single long un-roofed enclosure serves as bathing house for every man who wishes to disrobe in public and don a regulation bathing suit - with skirts. There is not a single private bath room on the entire strand, not one. BODY SURFING AT MANLY BEACH, AUSTRALIA. The man in the airship will look down upon South Sea Islanders, upon natives of New Guinea and even upon cannibals of New Hebrides all enjoying the delights of sea bathing. Doubtless he will report strange watering places in portions of the globe where few suspect that such resorts exist. 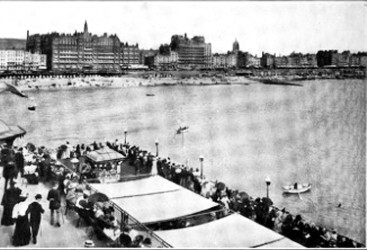 Geoff Cater (2016) : A.H. Ford : Seaside Resorts around the Globe, 1909.